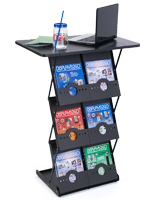 Portable podiums are a little different from some of our other reading stands in that they are collapsible. 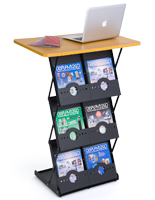 Because the folding lecterns in this category feature knock-down configurations they can be shipped, transported, or stored with ease. 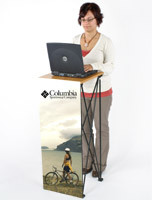 A portable podium can be ordered variety of styles, including different materials, colors, and features. 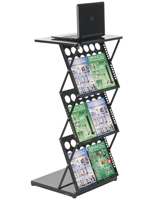 These convenient folding lecterns are frequently used for short-term events. 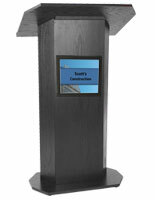 As a result, schools, offices, and convention centers commonly opt for a portable podium. Not only are the pulpits compact, but they are also lightweight. This way traveling sales representatives and public speakers don't have to worry about breaking their backs just to get to the next event. The lighter weight also translates to lower shipping cost, which another big reason for their popularity among our customers. 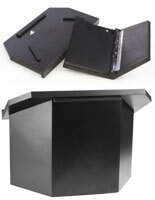 What makes folding lecterns so cost effective for shipping? 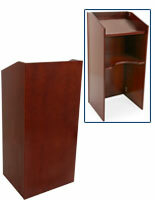 Portable podiums have the ability to ship in flat boxes rather than on a pallet or in a crate. This way a lift gate is not required just to get the lectern to its final destination and the cost is significantly reduced. 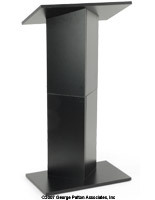 Knock-down pulpits and fixtures can be shipped to event locations and venues by the user after they have received the order. Customers can also transport the units themselves without having to rent a large truck or moving van. The compact assemblies fit right in the trunk of a car! Folding lecterns do require some assembly for use, of course. However, the process is relatively simple and can be completed in a matter of minutes. Most of the our knock-down pulpits are equipped with foldable panels that feature hinges, but others feature unique truss designs that expand and contract for simple setup and take down. 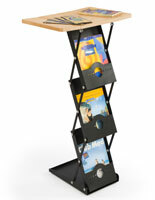 Most of these public reading stands don't even require tools for assembly in most cases. 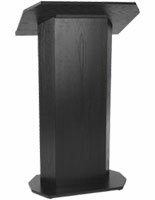 Many times portable lecterns and folding podiums are not as tall as standard sized speaking stands, but rest assured that all of our floor-standing collapsible models feature full height so orators are always comfortable during their presentations. 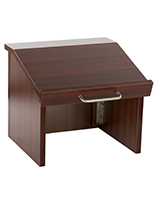 Of course we also offer folding tabletop systems to accommodate other applications. 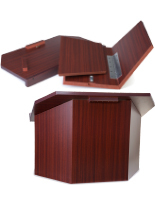 The features of these portable lecterns and pulpits are incredible. 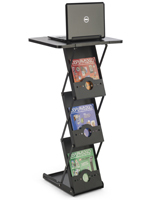 Some units are equipped with concealed shelves that are great for storing copy for speeches and lecture notes. The hidden design helps avoid distractions and keeps the focus of the audience on the speaker. Orators can even store a cold beverage on the shelving if they need to. Nothing is worse than a dry mouth when giving a lengthy lecture or presentation! One of the most popular features of the folding truss pulpits is that many come with a carrying bag included. Specifically designed to fit the disassembled stand neatly and tightly inside, the carry cases make transportation and storage between uses easy. The attached shoulder straps also help to lighten the load, so users don't have to strain themselves during transport. 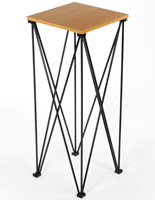 Another useful element of the foldable truss lectern line is the availability of custom graphics. Custom printed vinyl graphics or full color digital printing are offered for some models, which makes them perfect for trade show use and other company-specific applications. 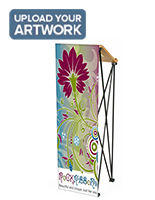 Corporations and organizations can proudly display their emblem or slogan to increase brand awareness. The large format of the graphics also comes in handy when trying to stand out in a large crowd of expo booths or convention exhibits. The customized options will double the effectiveness of any presentation by reinforcing the cause or company behind it. In addition, our customers really appreciate the savings that comes from buying the graphics and lecterns from a single source. 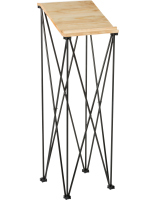 Shopping by features is but one way find the right podium. 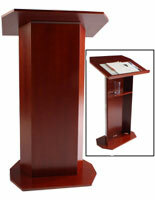 Other customers are more concerned with color, finish, or even just the material used to make the lectern. We offer only the most durable options, which are made from solid wood and wood composites, such as medium-density fiberboard (MDF). 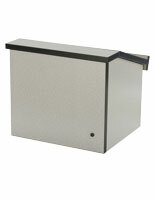 Sturdy metal is used for the hinges on the folding models as well as for the trusses on the knock-down versions. 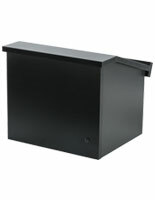 Either way, the rugged construction is built to last through many events and hard, repeated use. 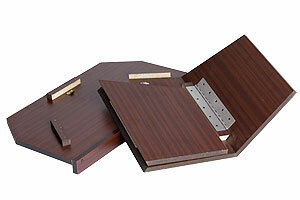 Wood laminate is used for most of the reading surfaces, so there are quite a few different finish options available.